Coming home is a logic puzzle. A rectangular or square grid is divided into regions. 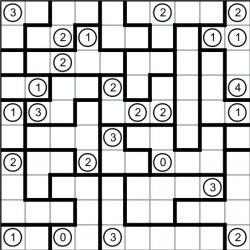 Some cells of the grid contains circles (empty or with numbers). The task is to move the circles vertically or horizontally, so each region contains only one circle. The numbers in the circles indicate how many cells they have to pass through. Circles without numbers may move any distance, but some of them stay put. The circles cannot cross the tracks of other circles and cannot move over other circles. ~ We create logical games for commercial use. ~ We create games for newspapers and magazines. ~ Languages : Romanian, English, Australian English, French, Spanish, Italian, German, Danish, Portuguese, Norwegian, Dutch, Hungarian, Icelandic. ~ The site is updated regularly. ~ For suggestions - games and / or collaboration - please contact us.